For a downloadable datasheet on this product, please click here. The Ceramic Materials Manufacturing division of the Kurt J. Lesker Company manufactures advanced metal oxide ceramic materials that are used for a range of applications including storage of energy and information, energy conversion, optics and electronics. These materials are used for a variety of thin film physical vapor deposition (PVD) processes such as sputtering, laser ablation and evaporation. They can also be packaged as inks, suspensions and slurries used to make in non-vacuum coatings for printed electronics, and as fine chemicals for end users who do their own bulk ceramic fabrication. 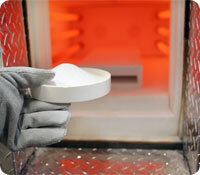 With more than twenty years of manufacturing experience, metal oxide ceramic targets are made by KJLC from powders synthesized internally and densified using a proprietary low stress technique. Targets made with the KJLC process have better mechanical homogeneity than a hot pressed or uniaxially pressed and sintered part. This means that the customer will experience less cracking and greater target utilization with our product than with targets made by other methods. The resulting ceramic will also be fully oxygenated Vs the oxygen deficient product that results from hot pressing. The process insures a highly uniform, dense, product suitable for use in sputtering, laser ablation or as an evaporation source. Target materials are available in a comprehensive range of sizes, from evaporation pieces at 3 – 6 mm, to round discs at 1" diameter x 0.125" thick up to 13" diameter x 0.5" thick, and tiles at 8" wide by 8" long and 0.5" thick, to accommodate the requirements of most popular deposition tools. 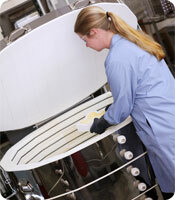 KJLC uses high purity metal oxide precursor materials in the fabrication of its portfolio of ceramic powders. Precursors are synthesized using a series of high energy mixing, calcinations, and particle sizing processes which insure a stoichiometric material suitable for densification. 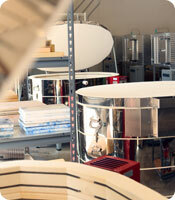 Ceramics produced by KJLC are available in a range of chemical purities, typically 99.9% to 99.999%. The company’s typical material is manufactured to be stoichiometric but custom formulations are also available upon request. KJLC has developed a comprehensive in-process quality control system that insures part-to-part uniformity and conformation with our rigid target specifications. The final product is also characterized using a variety of methods to insure phase purity, chemical purity, grain size and mechanical compatibility with most popular deposition tools. GDMS, XRD, ICP and Particle Size Analysis are periodically used to verify that process parameters yield the desired product characteristics. 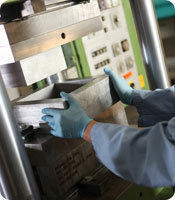 KJLC performs periodic audits and tests as part of the normal management controls. The Standard Dimensional Tolerances for ceramic targets made by KJLC are +/- 0.010" on diameter and thickness. We highly recommend that ceramic targets manufactured by the Kurt J. Lesker Company be bonded to a backing plate to enhance cooling and the mechanical stability of the target during deposition. Targets can be bonded using two technically distinct methods. Bonding alternatives include elastomer, typical used for non-conductive materials, and metal solder bonds with pure indium. 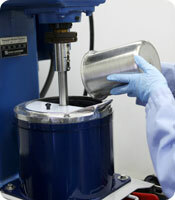 Consult with your sales engineer to determine which bond type is right for your application.